BIAFRA: WAKE UP! YOU STUPID NORTHERNERS. –BY MUSA YUSUF. The North should disembark from One Nigeria. Northerners should NOT and MUST NOT discourage anyone from seceding from Nigeria. We should focus on saving ourselves, our space, our economy, our youths and our future. We have everything to survive and make a great country. We only need leaders with vision and courage to pull us through. It is estimated that there are more than 20 million Igbos in the North, buying our properties, our farms and market stalls. Living more comfortably than the average Northerner. They(Igbos) are our doctors, mechanics, plumbers, electricians, lawyers, accountants, estate agents and even teachers in private schools. They build huge churches, exquisite homes and flashy cars. At night, they hold parties and meetings to consolidate their grip on our land, our commerce and our lives. How many Northerners are there in Igbo land, and what do they do, how do they live? Have you ever checked? Wasn’t it just recently that they threatened to register all Northerners living there? Well, almost all Northerners living in Igbolands are labourers, guardsmen, house servants etc. Tell me a Northerner who is anybody through the Igboland…. None, I assure you. If you know anybody, publish their names on the social media and circulate. In the next 15 years, their population in the North will reach a whooping 38 to 40 million. They will double their current number and influence. They will control our resources, our economy (which they are already doing), our social lives and even our politics (which they are already experimenting in Lagos). WAKE UP, you stupid Northerners. The Igbos have a plan. We don’t have even a thought of what is happening to us. Our youths are frustrated into consuming drugs which the Igbos bring in tons and sell to them. Whatever jobs our youths should be doing, the Igbos are doing them. Our so-called business men and women have become their agents and of the Chinese to a lesser extent. Even some of the Chinese are here at the behest of the Igbos! Our ailing and failing factories are being closed down (like the sac-making factories in Kano etc), or being taken by them. They are taking over everything while we preach peaceful coexistence. It will be a coexistence with us being crushed at the bottom. So, STOP asking or begging them to stay. They have a plan. Who among their top leaders have you heard condemning or even cautioning the agitatiors? They have an immaculate plan which they are quietly implementing, while we sleep –Stupid Northerners! LET THEM QUICKLY GO BACK TO BIAFRA COUNTRY, ALL OF THEM. WE SHOULD PART WAYS WITH THEM SO WE CAN HAVE BACK OUR LIVES AND OUR FUTURE. 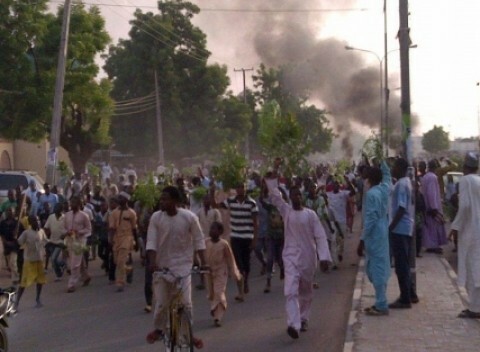 NORTHERN YOUTHS AND ELDERS MUST BEGIN OUR AGITATION NOW!